Customer testimonials – something that deserves a place on the front page of your website. Or at the top of your social media accounts like ratings and reviews on a Facebook business page, right? Of course. After all, they are the proof of your outstanding work. But are these the only places where reviews can exist? Only on a website page or front page? Not elsewhere. The same goes for your customer testimonials. They will have more influence on visitors when you repeat them several times. That doesn’t mean you should put them on all of your web pages for repetition shake. It will make you look fake. Let’s say if you submit the same blog post in the same way on Facebook, Twitter, Instagram, and other social media accounts. It won’t give you the best results from all networks. In fact, the results will be the opposite. On the contrary, if you submit the same blog post in different ways – as a video on Facebook, as a news post on Twitter, as an infographic on Pinterest, and as an image on Instagram – only then will you reap its maximum benefits. Similarly, you have to promote your customer testimonials in different ways on different channels to gain the maximum advantage from them. In this blog post, you will learn to use customer testimonials in 7 different ways to leave a long-lasting impression on your target audience. Thousands of praises from your previous customers won’t necessarily help visitors make a purchase decision. Yes, they do make visitors think a bit about your product or services. But, what makes them click is: results. Tell them about the results. Use case studies as your weapon. Steve Kamb, the owner of Nerd Fitness, claimed to generate leads from one of his published case studies. Did you notice how he transformed customer testimonials into a case study showing exact results with time invested? When everything else fails to capture a user’s eye, posts like these make users believe the results of your work. The formulas below will help you create a clickable headline. Visit Zapier’s blog. Click on the blog post that interests you the most. Scroll to the end of the blog post, and a relevant-to-the-blog-post testimonial will slide in to tell you about how Zapier helped users with their business. Zapier’s testimonials are supported by call-to-actions to invite readers to try Zapier. Zapier sets a perfect example of how to make the most out of your blog with a slide-in testimonial relevant to the blog. Blog readers and visitors are people who are interested in that particular topic. And if readers scroll to the end, that means they are actually looking for some solution. Obviously, your blog is relevant to your site, product, or services. With a slide-in testimonial relevant to the particular blog post, you are telling users that you have a solution to their problem. Plus, you are showing proof from others you have helped. “Customer service is the new marketing.” – Derek Sivers, Founder of CD Baby. Does it catch your attention? Everybody is on a hunt for quotes for inspiration. #MondayMotivation on Twitter is proof. Even if you are not in a mood to read something, a quote relevant to your life will never fail to catch your attention. Users are like you. Catch their attention instantly with quotes blended well with customer testimonials just like Copyblogger. Customer testimonials in quote format are easy-to-read and understand. Plus, putting the image of the particular person will make your quotes look more trustable. That will add credibility and legitimacy to your testimonials. As you know, Quora is one of the best Q&A sites. Users search Quora as an answer to their questions. Or as a solution to their problems. 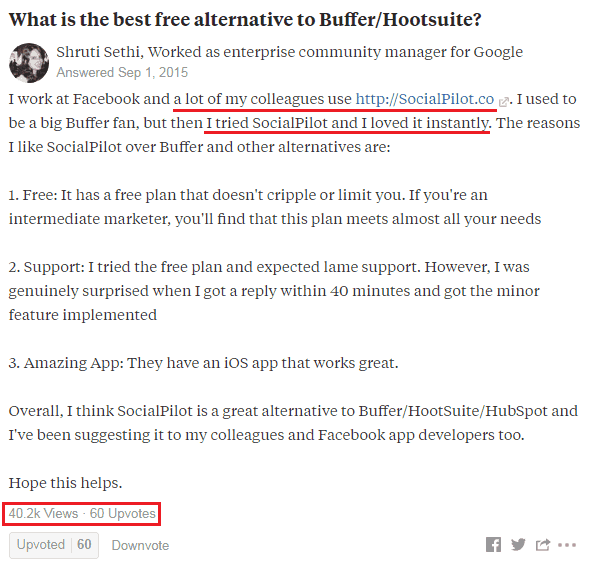 While marketers engage in Quora to generate traffic to their sites, you can also use it as another network to promote your testimonials. I searched one question relevant to my company, SocialPilot, and one of our customers answered that question. That answer looked more like a customer testimonial. You too can reap similar or greater benefits. Start searching questions relevant to your brand on Quora, and put your customer testimonials as an answer. You can also request your customers to answer on Quora from their profiles to make answers look more genuine. Email subscribers are users with a certain interest in your products and services. They are more passionate about hearing stories from your previous customers than from anyone else. It just takes the right approach at right time to turn subscribers into customers. Emails wrapped with previous customers’ stories is the exact button to press. Let’s go through an example to understand this concept. 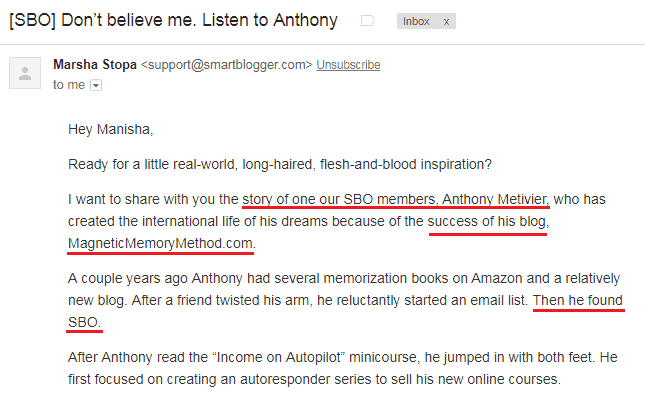 I was taking a writing course of Jon Morrow titled, “Serious Bloggers Only [SBO].” You have probably heard about it. Once I subscribed, they sent me an email that included one of their student’s stories. That email was all about changing life of the student when he took the course. The subject of the email was, “Don’t believe me. Listen to Anthony.” It had a short description of how their customer’s life changed because of the course and a video in which the customer himself told the story. Email subscribers may not believe you, but they will surely believe your customers. Send users stories designed with milestones your customers achieved after they started using your product. Email subscribers would like to know about the achievements of your previous customers when they used your products or services. HubSpot is not only good at blogging but also great at publishing read-worthy ebooks. It’s a hub for a variety of ebooks. Oh yes! That’s a clickbait title. It’s in the form of a customer testimonial. What Type of Content Will Crush It For Your Business? It is giving you social proof of somebody who made money with blogging. You too can learn the tricks from this ebook. Many people won’t hesitate to submit their email addresses to get access to this free ebook. Kudos to HubSpot’s ebook strategy. Images, infographics, videos, and there is much more you can utilize to showcase your customer testimonials in a visual way. Mastek offers agile solutions for enterprises. Like others, this brand also has a five-star rating list of customer testimonials. Instead of simply posting customer reviews, Mastek started generating infographics telling the whole story of their customers. 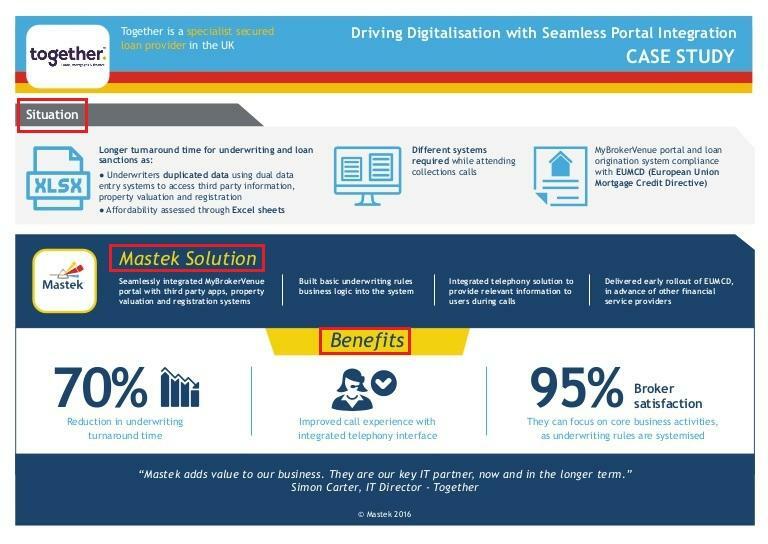 Mastek has beautifully described the problem of the customer, and how their company offered a solution. Plus what benefits the customer received. Start making images presenting your customers and your brand. Don’t forget to include the customer’s current situation and your brand’s solution. Now, this is somewhere you can become extra creative. Customer video testimonials are something everybody knows about. But going the extra mile is something Help Scout knows very well. Help Scout personally visited their customers to see how their tool helped customers in various ways. Their visits resulted in videos no one can deny. Have a look for yourself. Great brands use their customer testimonials well. Now it’s your turn. In which ways do you plan to use your customer testimonials? As case studies, video testimonials, emails, or all of the above? Please share your thoughts in the comments below. 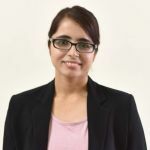 Manisha Sukhyani is a Content Marketer at SocialPilot, a social media scheduling, and management tool. She authors in-depth articles that teach users about how to grow traffic through social media marketing. She loves walking on a less traveled road. Thanks for the great tips! I’m always telling my clients that testimonials are their most important piece of content marketing.